Although no one has ever asked, tube meat is my preferred medium. However, I seem to be in sweet trend at the moment and this post is no different. The inspiration for my Fig Newton Hot Tub was my friend Paul’s retirement party. Paul is s a terrific guy with a passion for skiing. After figuring out that I wasn’t going to be able to craft a rocking chair out of mini skis as a cake topper, I started fretting. Then, one of the guys mentioned Paul’s affinity for hot tubs, and the dye (sic) was cast! Retirement = a jello-based hot tub scene. It took two attempts to make the hot tub “water” with the first try resulting in a leaky, horrific mess. 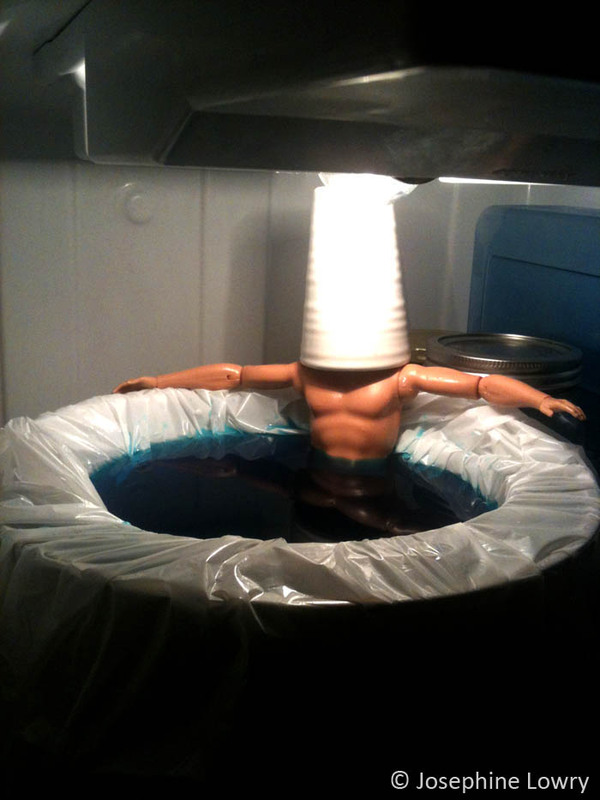 My second try was more successful and by lining my steamer container with a trash bag + two large packages of blue-flavored Jello, I was able to create a somewhat life-like hot tub. Brown chicken brown cow. Who's chillin' in your refrigerator? I had planned to use those delicious chocolate sugar wafers to construct the side of the hot tub as they’d give it an authentic wooden plank feel, but the store sold them in a mixed package with strawberry and vanilla wafers and it seemed silly to buy a package that had 2/3 of something I couldn’t use. Luckily, the Fig Newtons on the shelf below were on sale and resemble cedar shingles. 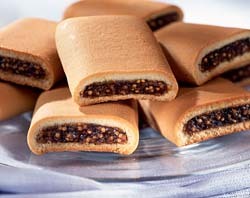 I first tried sewing the fig newtons together so they’d be connected, but still flexible and able to form a circle. However, I quickly realized that toothpicks would make for a stronger hot tub. 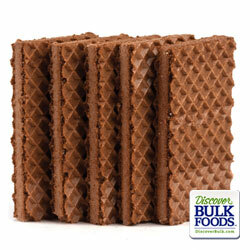 Using a staggered approach, I stacked the fig newtons three levels high using the steamer container as the form. While I always make my food art edible, there’s almost always the danger of sharp toothpicks. "Well, hello. Won't you join me?" Overall, this project made me laugh. And the guests at Paul’s party seemed to appreciate the humor in it. And, in a fantastic surprising turn, we ended up serving the jello as a side to the cake. Hee. Ken floats — I had to put a ceramic cup over Ken’s head so he wouldn’t rise to the surface of the jello and be a floater. No one likes a floater. 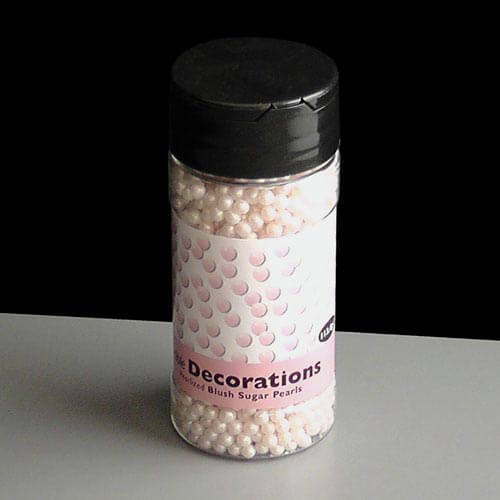 Bubbles — I had wanted to suspend grapes to mimic bubbles, but the grapes were too big so I opted to use pearl sugar balls. Sadly, the coating around the sugar balls dissolved, creating a disturbing effect in the semi-solid jello. Substituting champagne for water would have given the jello an effervescent look. I wish I’d spiked the jello with vodka or some other sort of boozy hootch. 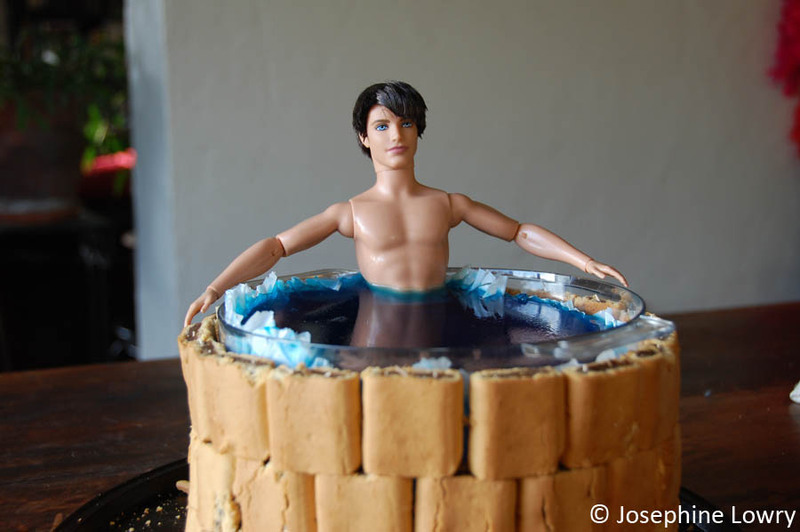 Naked Hot Tubbing— I kept Ken’s swimsuit on when I placed him in the jello. Silly decorum. Everyone agreed that I should have de-pants him. Yes, it’s an art, fun jell-o, fig newton hot tub. Because well, sometimes, weird silly things are needed.